Situated in Northern Auvergne, near the border with the Limousin and Centre-Val-De Loire, Montluçon has a population of just over 40,000 people. For years it has been the economic driving force for the whole Bourbonnais area and has learnt to adapt to the changing market needs of the 21st Century. The city faces the Combraille hills and stretches back down the Cher Valley, where the main industrial zone is located. The castle that once belonged to the Duke of Bourbon overlooks the whole city. The River Cher runs straight through the centre on its way to join the Loire. The medieval town centre is ideal for an evening stroll with its numerous timber houses and churches lining the streets. Montluçon has won France's competition for the best flower decorated city several times. 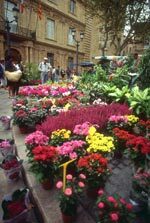 If you head down to Passage du Doyenne on a Saturday morning then you can choose from a vast array of flowers and decorate your own property. The town has three museums. There is one for shipping, one for music and one for the territory of Berry. While Montluçon is geographically outside of this historic district, there are many examples of Berry culture creeping in. There is also an art museum based in a chateau not far from the city. Built in 1926, it features architecture from the 17th, 18th and 19th Century. The surrounding gardens are styled in both French and English designs. The nearest airport for direct flights from the UK is in Limoges, which is also the destination for the TGV train service. Property prices remain fairly low, although there is little opportunity to rent out your property here. There are a number of bargain properties waiting to be restored. Do you know Montluçon better than we do? Do you have photos of Montluçon? In the west of the Allier department, in Auvergne. Access: Nearby Limoges has both an international airport and a TGV station. Economy: Heavy industry has long been a traditional part of the town. Interesting fact: The town has won the award for France's best flower decorated city several times.